The Carbon Hookah Hose by Vapor Hookahs is one of sleekest, most modern hookah hoses on the market. The carbon fiber styled handle is smooth and emanates a sense of class and sophistication, perfect for enhancing any modern style hookah. 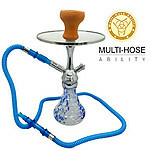 The silicone hookah hose is fantastic for regular smokers who enjoy a wide variety of hookah tobacco flavors. Silicone hoses are famous for not ghosting and for lasting a fairly long time. The Carbon Hookah Hose is durable and stylish, absolutely everything a hookah enthusiast could want! The Vapor Carbon Silicone Style Hookah Hose can be used on all Vapor Glass Hookahs and most other Glass Hookahs and Traditional Hookahs in the market.